I’ve gotten a lot of requests for fancy hairstyles (for weddings or other formal events) so I thought this would be a simple way for you to pull your hair half up! It can be done on curly or straight hair. And also on any thickness! I love, love your blog and all of your hair tips:) I am now curling my hair and I am excited that I am getting better at it! I wish you could come do my hair sometime:)I tried to watch your elegant half up and it says that the video is private? Is there a way to watch? Anonymous: Thanks for your kind words! Sorry, I always forget to make the video public. 🙂 I just changed it! I am so loving your blog! Every time I stop by here, I am so impressed! Thanks for the awesome tutorial. Can’t wait to try this out for myself! Great look! Thanks for posting. Love it!!!! I may still this this weekend for a wedding! First you can not spell and second why would you do this are a wedding hairstyle because it is to simple and plan for a wedding! First of all, you can’t spell either. Second of all, she said FOR a wedding not for her own wedding. You’re ridiculous. What is wrong with simple for a wedding? I’m sorry, but there is a LOT to stress about for weddings and doing a simple but cute hairstyle like this means less time panicking before the ceremony and turning into bridezilla. NOT to mention the fact that simple is often times more elegant that the girls that put in hours and hours into their hair. This looks like she actually put some effort into and is classy. Thats so cute! I can’t wait to give this a try! Thanks for fixing it! I was the anonymous earlier…. I don’t have a blog and never sure how to post comments! Can’t wait to try! Although….it will take me much longer then yours did! Thanks again! Love this hairdo!! I will definitely try this soon! You have the BEST tutorials!!!! Thanks for sharing!! This is sooo cute! Thanks so much for the tutorial! Your videos are wonderful – you are so to-the-point and informative and very methodical. LOVE.THEM. Super cute. Gonna have to try this! Wish I could get your volume in my hair. I love this! I just cut my hair (it used to be waistlength) to shoulder length and I’ve been so lost on hairstyles. Thank you for teaching me a new one! I have been seeing this everywhere in Boston! Love it! Cambria: It’s J. Crew outlet from last winter. But it’s still one of my favs! Thanks! this is so beautiful! i’m definitely going to try it! Hey Kate! I have seen your pictures all over pinterest lately. I decided to check out your blog and realized you are from Raleigh! I might be late to the game…where is your new studio? your hair is getting LONG! Love this! I just forwarded it to my sisters that have hair that length. Thanks for sharing! This post is amazing! I’m so excited because I just cut my hair short and I’m not quite sure how to do something different with it! I found your blog via Pinterest and I must say I am hooked! Thanks for sharing your faith as well as your many talents! Anonymous: I’m not sure I understand the question. Are you talking about this style pictured above? Are you able to see the video tutorial? If you are just talking about finished spray, I do use a good amount of hair spray. But also, have your hair sprayed a bit before you start pulling it back so you can get a little “grab” on the Bobby pins! Tried this today with wet curly hair and it turned out SO cute! Thank you so much for the tutorials and tips. Found you on pinterest and have been hooked every since. Thank you thank you thank you! I went to get some balloons for my sons birthday party tonight, and the lady at Kroger had her hair done like this. I HAD to ask her how to do it, and she told me about your blog! LOVE IT! Jami: thats awesome! 🙂 Happy Birthday to your son!! Thank you! I am the newest follower of your blog. 🙂 I love to find new ways to do my hair. I will try and see if I can make it look as nice as you. You make it look easy. Very helpful video! Love this tutorial! Super easy, simple and very pretty! Can’t wait to browse through and find more ways to do my hair! Thanks for the video! I am a hairstylist myself and love great new ideas! Love it! Found your blog thru Sugar Bee…and so grateful for your tips. I have never liked my hair, and not really known what to do with it. I think I’m motivated to try harder, now. Thank you so much. Gorgeous! Love this look! Thanks for sharing 🙂 Visiting from Southern Lovely! Would love for you to link this up to my diy fashion linky party tomorrow! It’s called DIY Diva Thursdays and this post is perfect for the party! oh my goodness! that is a beautiful updo! I love it! You make it look sooooo easy! I’m going to have to give it a try! : ) thanks for sharing! i’ve noticed in a few of your tutorials that you say to put the bobby pins zigzag side down. what does that do as opposed to the zigzag side up? Lauren B: the bobby pins will hold better and sort of lock in with your hair when you put them in that way! Plus it looks better from the outside too! Another great tutorial, thanks much!! I love this! I’ve been looking for hairstyles for work! Thanks! Gorgeous! 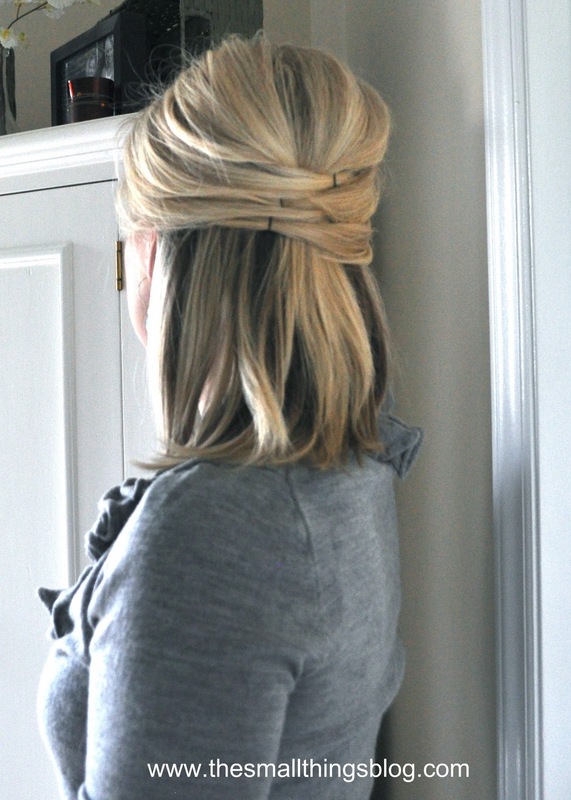 I’m going to try this with those bobby pins that have the rhinestones or pearls on the ends. Found this on pintrest yesterday. After 20+ tries (granted, some of them were hindered by wine consumption… haha) I finally mastered this! SUPER cute. My hair is way too long to tuck under, so the ends are loose. I’m going out tonight, so I’m just going to curl the remaining hair and hope it looks ok. LOVE your blog, and will definitely be trying more styles! so pretty, thank you for sharing how to do it with us. Hugs and wishes for a weekend filled with happy! I love this but am wondering if it would work as well for long(er) hair. Mine is almost to my bra line when it’s straight. It curls well too though, and I have a friend’s wedding coming up! So happy I found this blog. I love your hair tutorial! Your hair is the same lenght as mine, and you gave me tons of ideas for ways to make it different quickly. I have two kids, so I need quick hair-dos that are easy and cute. Just wanted to let you know that I featured you today @ Southern Lovely. Grab a button, if you’d like. Stop by and say hi sometime. I just found you on Southern Lovely and your blog is officially my new fave. Your hair is gorgeous and I LOVE all your tutorials. My hair is a similar style to yours so I cannot wait to try some of these things out! Could you still do this with long hair? I have curly hair and am always looking for easy styling ideas. The Bluths: aboslutely! It would be stunning! You are a genius! 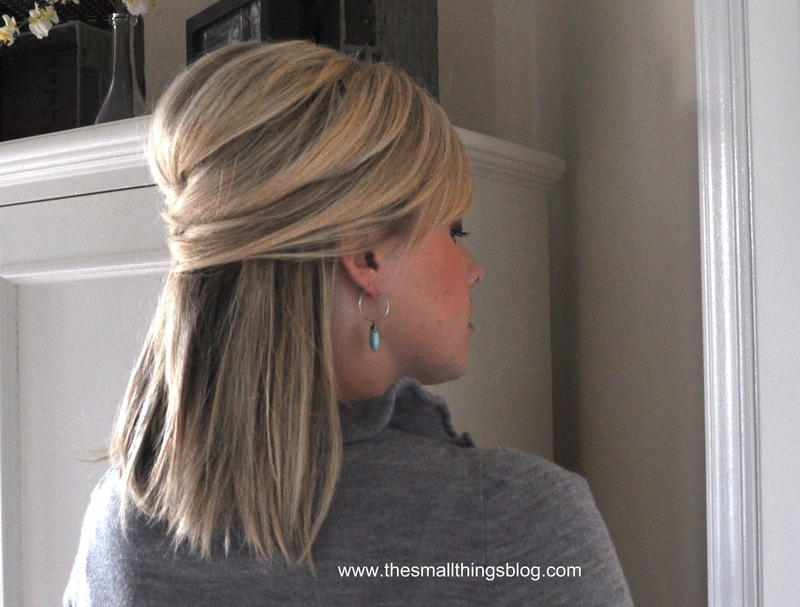 Awesome and easy hair do…I am going to try it! Thanks so much for sharing with all of us! Hi! congrads! This was the most viewed link last week at whatever goes Wednesday. I am featuring it today at somedaycrafts.blogspot.com. Grab my “featured” button. Thanks so much for the tutorial!! Love it! I needed this for a wedding I’m attending this weekend! Hey there, your blog is way cute and I’m a new follower. Love the half do, I’m always looking for new ways to wear my long hear. Love this! Can’t wait to give this a try! Kate, your hair is gorgeous and this tutorial was wonderful. I found you on pinterest and am a new follower! I thought I heard you say in the video that you use a special kind of bobby pin to get more grip– if so, can you share the brand? Thanks! Just wanted to say thanks so much for the tutorials- I’ve never had short hair before and after a visit to a well known salon in a new town, I now have unwanted short hair, lots of tears, and no clue what to do with it. But now that I have seen some of your videos and how adorable it looks on you, I’m willing to give it a try and see what I can do with it. Thanks so much!!! Wow, I am going to try this today! Easy, fast, and pretty – just what I like and need! Thanks so much for posting this, you’re a natural in front of the camera and as a teacher! I love this! I’m going to the Symphony tomorrow night, I think I’ll try this! Found you through Pinterest- so glad I did! Love all of your tutorials, thanks for sharing! So cute! Love everything on here! LOVE it! Found your pic on Pinterest! Can’t wait til my hair grows to try it! Just came across your site via Pintrest and immediately tried it. I am a ponytail everyday girl (because it’s all I know how to do) and this turned out awesome! Great tutorial! Thanks! @Amy: Leave these comments on the other post! Love this Blog, and you explain everything so well, that I was able to do a similar version of this on my short A-Line bob that I am in the process of growning out. Hi Kate! I found you via Pinterest… I loved your picture and tutorial for the elegant half up. I am pretty worthless when it comes to doing my own hair… On the first try it was so easy and it looks great! thank you! thanks so much for this tutorial- I and some friends found you via Pinterest, and for the first time in a long time, I’m doing something different with my mid-back length hair other than a ponytail. I wore this style to church this morning and got rave reviews from all the other ladies. I can’t wait to see what other styles I can try. Great tutorials! Thanks for the inspiration. I’m good hair-impaired, but you make it look so easy that I’ll continue to try new things! I’m in college and I LOVE doing different things with my hair everyday. Your website is the first one that I can actually follow and make senes of! I have done 4 of your hairstyles this week, yesterday I did the chic up do and today I did this style and 3 people recognized the hairstyle from Pintrest! I was so happy that I got it to look like you have yours and I also recommended your blog to 4 different people today, I hope that they pay you a visit! 🙂 LOVE THIS BLOG! I just wanted to say thank you for this tutorial!! I used this as my wedding hairstyle last month, but added in large barrel curls. It was absolutely gorgeous and I received so many compliments! You can See a very poor quality cell phone picture by clicking my name. Its all I have until we get our pics back from the photographer. Thanks again! I love this! So cute! I would love a post about hairstyles for different face shapes. I tried this hairdo today and it turned out so amazing! You’re tutorial video helped me so much! Thank you so much for all of the awesome tutorials! I have a question for you about hiding the bobby pins. No matter how hard I try, it always seems the whole bobby pin is visible….any tips on getting just the end of the bobby pin to show?? I love your tutorials! I notice your hair looks like it has something in ti to give it some texture. My hair is thick and very slick so it slides out of the bobby pins easy. What do you use in your hair? What would you recomend for me to help keep my hair in the bobby pins? This is fabulous! I’ve seen tons of blogs for doing kids hair, but I’ve wanted to find something to do my own! Thanks for your step by step break downs and adorable styles! You are amazing, I LOVE this and will use it. Thank you! amazing! Thanks for your easy step-by-step instructions and tutorials!! Can’t wait to try this one!!!! Hi Kate! You’re amazing! My hair is about the length of yours. It is very thick but extremely fine. It doesn’t seem to ever want to do anything like this. It doesnt even tease very well. Do you have any suggestions on what I could do to help it out? in the end you mention that you could put the bottom in a messy bun, if you were going to a wedding or something…can you show how to do that? Thank you so very much for taking the time to post these videos! They are amazing. I have Shoulder length hair was was clueless on what to do with it. Now I am super excited because of your posts. You have made them so your hair styles can be recreated. Love it! I am a nurse, so I consider myself an intelligent person. But I am a complete moron when it comes to hair. Thanks for posting this and breaking it down! I am a new follower of your blog! An I have to say that I LOVE it! :) I started using all of the products that you use and I enjoy them very much! I love this look! It works great! I have shorter hair, I was wonderIng if there is any way to create an up do that looks right, and not look like I have a two inch tail on the back of my head? Just new to pinterest and stumbled across your blog. Thank you so much for taking the time to do these. You make it look easy and some of them are. I did the half up one today and even going out in the wind it stayed in and tidy all day. Thanks again and keep them coming. Did this today for a holiday party! It was pretty simple and looks great! Thank you sooo much! My hair’s about 4-5 inches longer than yours, what should I do to hide the ends? They don’t tuck up like that and look a little funny. 🙂 Any ideas? i have long hair and love your idea, but mine turns out kinda wonky. is this style made for short haired people only? This is great. Definitely going to give it a try. You make it look so easy. It came out great. I will be trying this tonight for church! It’s so beautiful and I really hope I can get it to work with my hair! Thank you for creating such easy how-to tutorials to help us all! I have fairly long hair – Is there a way to modify this to make it work for longer hair? Love this style, so easy. Worked well on my long thick hair, just used pins to tuck the ends under the crown. This is so cute!! And it looks super easy! thanks for sharing your fun hair style! Found you on Pinterest. Super cute hair tips! I love this style! I tried it and it did not work out anywhere near as well. Oh well, next time! Let me just say that I LOVE your blog. I am not really into following blogs, but after my discovery of my new addiction, pinterest, I quickly discovered you! And my hair has never looked so awesome. I love this hairstyle! I have naturally curly hair, which I frequently wear straight but this works on both styles. Absolutely love it! I fold you on pinterest and I am addicted! I LOVE YOUR TUTORIALS!! I have tried several of your styles and had all good compliments!! Thanks for sharing! I just tried this on my hair and I was nervous because my hair is considerably longer but it worked like a charm! I love this style and will definitely be adding it to my repertoire! I love your blog! Thanks for sharing! I really appreciate your personal testimony, as well. Maybe it sounds corny, but God used it like a little hug for me 🙂 I can struggle a lot with not feeling pretty or “good enough.” Thanks! I love love love your blog! I like to think I am pretty good at doing my own hair so I have been trying some of your styles and they work so well. I wore the elegant half up yesterday to my prenatal appointment and the normally frosty receptionist was going on and on about how much she loved it! My hair is thick and down to the top of my behind so I have to use A LOT of bobby pins but your instructions are so good that I can still manage the styles. Thanks also for the video on using the volume mouse, I could never get that right. I just came across your blog and I am so excited…. I have been “hairdo challenged” my whole life and cannot wait to start implementing some of your tips and styles. Hello! I write from Monterrey, Mexico. I am writing to congratulate you and thank you for sharing all your secrets and tricks of hairstyles, I am fascinated! Both my hair cut today as yours haha hope to follow in your footsteps. Thanks! Love this! Thank you so much for the how to! i absolutely LOVE this! i was looking for a hairstyle for my date for valentine’s day since i have a very difficult time with my hair, and this is definitely what i’m going to be using! thanks for all the awesome tips! This is gorgeous… I am going to try it tomorrow, hoping it will work out 🙂 Thank you! I love all the ways you style your hair. I am never very creative, but you make it look so easy! I absolutely LOVE watching all of these tutorials! My hair is a little bit shorter but you’re giving me so many ideas so that my hair doesn’t always look the same! I love it! Keep them coming! Thank you for sharing all this! I’m finally doing pretty things with my hair! Awesome Blog Kate-I am thrilled to try some of these styles on my hair. I am always looking for something new! You have great tutorials! I am wondering if you have any suggestions for a professional hairstyle that works for long hair and could be worn to a medical interview? Did this and got lots of great compliments!! Thanks!! I love your blog it’s amazing! I have the same length hair, I could never do anything with it now I can do so much. Thank you! Thank you so much for this style posting. I had an out of state hairdresser follow it for my son’s wedding with decorative hair pins to rave reviews. You can see the outcome on my Pinterest ‘Wedding Trifecta’ Board– I’m the mom with all 3 kids getting married inside of 7 months and our hair is almost identical. Next up, I need a style that is resilient to winds for a tropical destination wedding in early May. Any ideas? can this work with long hair?? I love this style so much!! For some reason I am determined to make it a go-to style for myself, but I CANNOT get the first section to stay put!! I have super thick hair, and I try to take a smallish section of hair but I just can’t get it secured well enough. I have tried your tip of putting bobby pins in “upside down” and that does help, but it just doesn’t stay!! Any tips? I love your utube instructions on how to style your hair! Thank you! I’m going to let my hair grow out like yours. Love your hair! I adore your hair cut! What would you ask for at a salon? Im using this style for my senior prom! (: Thank YoU!! I just found your cite and am excited to do my hair in different styles. I have thinner hair. When I try to do this style my hair seems to slip out and not stay. it kinda swoops down when I do the sides. Maybe I don’t have enough hair? Any ideas? Thanks so much for your time you put into these..
Hi, Kate! I am a hairstylist in Pennsylvania. I took a picture of your cut to a friend of mine so she could cut my hair like yours. It didn’t quite turn out. Could you please describe the angles and layers of your cut so I can tell her when I go back for a trim on Tuesday. Thank you! tried this and loved it the video really helped. i have really long thick hair though so it was tricky trying to find an alternative to just tucking my ends under. could you maybe post a video of you doing this style with some who has long hair? Awesome blog, I’m going to give it a shot tomorrow. Thanks for taking the time to share! Your tutorials are so helpful! I get compliments everytime I go out with one of your hairstyles. Thank you! I am going to try this style tonight for a formal I am attending. I am so excited and hope it is as easy as you make it look. You are adorable too and I thank you for the great info and cute styles! Thank you for this hair tutorial! I have extremely long and extremely thick hair. My friend that does hair professionally wont even touch it; I have to go the same person who did my hair when I was 4 because she’s the only one who knows to block off enought time (20+ years). Anyways, this is the first one that I have found a tutorial online that actually works on my hair! I had to cross about 6 times a side, but it looks amazing! I’m going to “test drive” it tonight to see how well it stays in, but I can’t wait to do this for work! No more buns or pin-straight hair! Tried this style and I got so many compliments… even my husband complimented me on it!!!! Thank you for your wonderful hair tutorials! love this……….can’t wait to try it. This looks easy…I’m excited to try it out. Like many others, I found you through pinterest. I just wanted to say THANK YOU!! I watched your video on how to do The Chic Updo and I was able to do my hair like that for a wedding I was just in last weekend. It was easy and turned out really cute!! I got compliments and even had one girl ask to take a picture of my hair, she is getting married in a few months and loved the style! Posting this kind of information is very useful for its reader, Now this is highly recommended post for River Sand, do something in future smiler with this. Thanks for sharing…beautiful…I am going to try this right now!! I love you tutorial! Gonna try all of them when I get the time! This might be a dumb question, but what kind of bobby pins do you use? LOVE the half up do! You make it look so easy to do I really think I could do this one! I have curly hair and am looking for some EASY and different things to do with my mop! Thank You!! This is by far my favorite updo to do on myself. 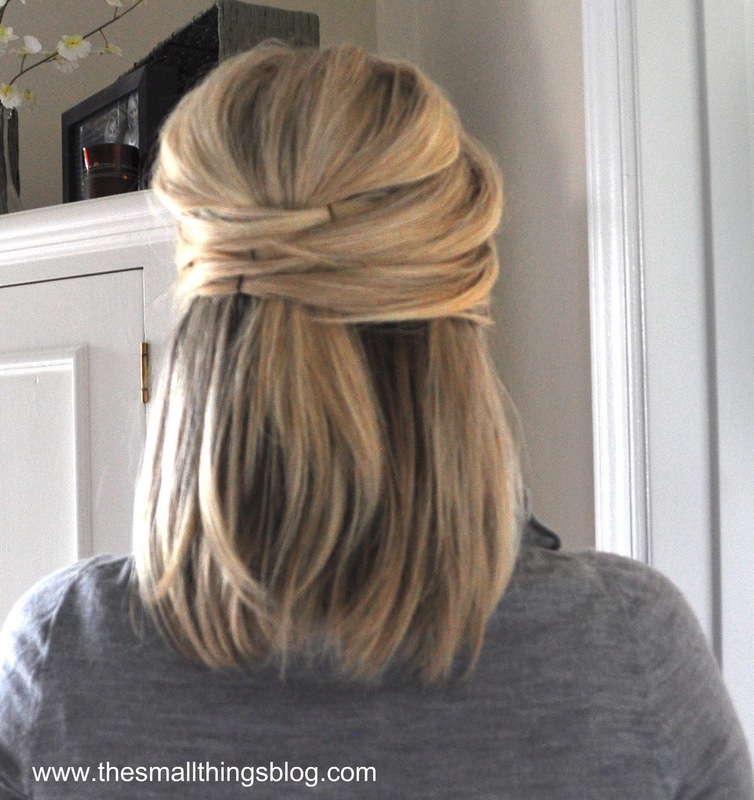 I combined this along with your double messy (knot) bun, I LOVE IT!! I have never been able to do hair myself until i stumbled onto this blog through pinterest! I absolutely love all your tutorials! You do a great job! I LOVE LOVE LOVE your videos. I have a question for you. I have shoulder length layered hair (really thick) but no bangs. I really want to try the Elegant Half Up but I am not sure how to part my hair or if I should part it at all. Any advice would be appreciated! Thank you so much! Wanted to thank you. I have been gettng tons of compliments on my hair. I have been working my way through each one of your hair tutorials. It’s been a lot of fun. I’ve finally gotten out of my hair rut! Thanks again! I would love to know what type bobby pins you use! I’ve used plenty over the past few years but none hold very well and they are extremely loose so I end up having to use a lot more than I should. Thanks so much for your videos! They are lifesavers big time 🙂 Also, I like reading your blogs about church and things you are involved in and I’m glad to see there are other people out there who love God and are apart of churches 🙂 It’s inspiring to people who don’t know Him. this video has inspired me to do a little more with my hair in the morning.. I always end up walking out the door with my hair pulled back, but adding a little crisscross action would make it much more elegant. thanks for the tutorial! Beautiful! You’re hair looks great! Love the video. I love your videos and your blog!!! i will try it 😀 thnx! This is the only way I’ve been able to pull back my heavy and long hair back for work without giving me a headache – thank you so much for this tutorial!!! That is a nice fancy hair style. The hair style you have can be applicable in any type of occasions, whether it’s a wedding party or birthday party or others occasional gatherings. The video is also good and inspiring. I just did this hair style to go to a wedding this past weekend. I actually had complete strangers talking about my hair during the ceremony…I could hear them sitting behind me, and I had a different girl approach me to ask who did my hair, as well as some friends who were positive I had gone to a salon!!!! THANKS SO MUCH!!! I felt so beautiful! you did that!!!! I love your hair tutorials! They are so easy to follow. I am trying to get away from my mom hair and these ideas are great. Ale fajna stronka, warto poczytac. I’ve been watching your hair tutorials for about a year now and yours are without a doubt THE BEST out there. Super easy yet beautiful- even I can do them! Thank you SO much for sharing and making me look MUCH more hair-savvy than I actually am. You are AWESOME!! This is my favorite hair style. It fun, elegant and easy. Thankz for sharing. I love your inspirational videos on ways to do hair. Thank you SO MUCH for taking the time to do this for all of us with a lot less talent. You are amazing!! First time I’m seeing your blog. It is wonderful! You are lovely! Designer cheap hermes handbags are considered as being one of the most essential style accessories with which to create a fashion cheap chanel handbags statement. They are taken as a symbol of your personality and also reflect your connection discount prada handbags with a special brand. It is all about spending to find your hot designer bag. Yet in some instances these mens jackets may cost a fortune and hence many merely cannot afford to buy them. In such instances you should search for catier love that happen to be as nice as authentic. Like a few others on here, i have a little longer hir and the ends stick out funny. Any ideas on how to hide/tuck them? I suggest that don’t be addicted to hår extensions because this is not for always but there is disadvantage too.There is a great danger that you can become addicted to hair extensions. I don’t know if you will see this on here now it’s quite an old post, but I have a question. I have long hair, and it’s not very easy to style as things always drop out. I want to try this style, but I can’t get the uplift at the back when you do the first grab of the crown, I find as soon as I stick the pin in it all drops, I live in the UK so not sure I have the same access to products as you and I usually find they never work when I try them (probably me not using them correctly). Second question, how do I adjust this style for long hair as when I bring the sections across at the back I have all the rest of the length dangling down and can’t tuck them up with the pin. I find with most of your styles I’m struggling to deal with the extra length as I don’t know how to pin it up when there’s too much hair! Also again, it drops out! I’ve tried this style on my hair numerous times with no luck. My hair is really long so maybe that’s the problem? It is about halfway down my back. I’m also having trouble “hiding” the bobby pins…..the ends keep sticking out at top. Any suggestions for long hair? Well I think this hair style is best in weddings and the half up hair style is looking pretty good too in photos, I like it. The great post on your blog, it really gives me an insight on this topic. Matemingler is the number one dating site for singles seeking long-term relationships. Join for free to be matched with compatible singles. This is simple yet so elegant. Love it. I think this is one of the such a lot important info for me. common issues, The website style is perfect, the articles is in point of fact nice : D.
My hair is quite thick and still pretty short (currently growing it out from an angled bob). But I am still really happy with how this style turned out on me. This will be a go-to. Thanks! This is a great step by step tutorial. I love the look and it literally only takes 5 minutes. Thank you for the tip! Help! I think I am hair inadequate. This style looks really simple and cute yet every time I try it, it falls apart. I even have a very similar hair style as you too. So cute!!! My hair is just about your length just a little shorter in back and I can never find cute hairstyles! I found this on pintrest and did last night for a wedding I was attending! It turned out super cute! I am now subscribing to your blog!! Thanks for sharing about Half Up Wedding Hair Style…………..
more than just yοur articles? I mean, what you say is valuable and everything. could definitely be one оf the most beneficial in its niche.